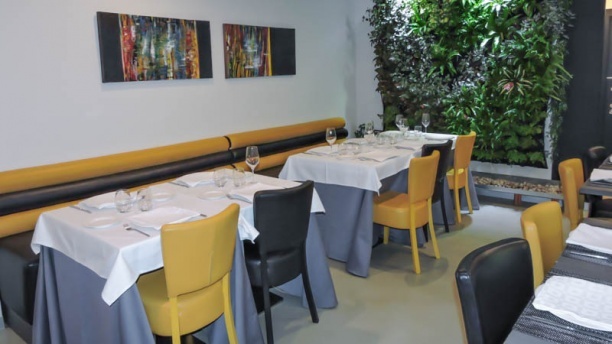 La diferencia es que nuestro restaurante combina una decoración modernista y clásica, con una galería de cuadros modernista a la venta en su interior; unido a su cocina que combina platos tradicionales con nuevas propuestas culinarias. Nuestras especialidades son rabo de toro y solomillo Doña Jerónima (solomillo de cerdo). Nuestro restaurante tiene un jardín vertical, y la cocina vista. Decorado estilo modernista y con un tragaluz. Se encuentra emplazado en la plaza de las flores, junto a la oficina de turismo y el museo de Ángel Garó. El restaurante da su nombre a la fundadora del restaurante más antiguo de Benahavís, La Sartén. Los propietarios son sus nietos, hijos de la antigua gerente de La Sartén. Fantastic evening with great service and lovely food! It was my mom’s birthday and they could not have been nicer! They laid on a cake and champagne at no extra cost! Really super. We always make sure we come here for lunch because it was always the best food we in Costa del Sol. We stay in Benalmadena and eat through the area. However, this year we found the food not presented as good and not as tasty. We were very surprised ! Sat outside in fantastic late winter sunshine. We have enjoyed this restaurant and fine dining several times. We recommend strongly that diners give this Casa Dona Jeronima a serious visit for good food; good, friendly and professional service and lovely ambience. We visit Estepona a couple of times a year and are always sure to visit Casa Dona Jeronima. The food is fantastic and the atmosphere on Plaza des las Flores is second to none. Wonderful on a nice evening to have a great meal with friends. Class stuff. Outstanding tataki tuna. Beautiful confit duck. Nicest postres for miles. Decent house wine. Lovely staff. Brilliant location. Worth every penny. Great restaurant. Lovely buzzy ambience. Great service. Delicious food. Arrived for 8.30pm, restaurant busy, great atmosphere where we were seated outside, staff all well trained, friendly & on top of their game. The food was wonderful. We had seafood, pasta, salad & all were delicious. Menu in Spanish & English, staff able to communicate in English which helped. Family friendly. Third visit this month and definitely up there in the favourites list. Many thanks to the lovely staff. Excellent in every way with delightful staff throughout. Food, wine, accompaniments and ambience. Second visit in just over a week and will be back again very soon. the restaurant is excellent in every way: The food quality and selection, the wine and the very pleasing ambience, both inside and outside. One of the best we have eaten in Estepona. Will become a definite on our 'dine out' list. Wonderful welcoming, friendly and helpful staff throughout. Thanks Team and see you again soon. Have eaten here a couple of times now. It's a beautiful location food as great and service friendly and attentive. Highly recommended. Lovely dining experience with great value menu del dia and tapas menus. Would highly recommend this place to anyone who loves great food in nice surroundings.